The Ironclad Gamechanger GC55-MD basketball system is a great choice for any family looking for a top quality, affordable goal. The purpose of this basketball system is to offer customers a unit that includes the design features most commonly asked for such as bolt down post, adjustment crank, tempered glass backboard and breakaway rim. Perfect for driveways, this basketball unit is easy to install, includes premium features and is backed by Ironclad's Lifetime Warranty. 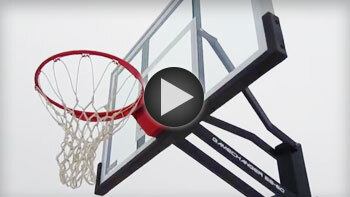 As our name suggests, Ironclad basketball goals are tough as nails. These units are designed to last through several generations and Ironclad backs that promise with an unmatched Lifetime Warranty which covers damage or failure due to any type of basketball related activity. This includes dunking and hanging on the rim! Don't get stuck paying for "premium" basketball systems that don't offer such a comprehensive warranty. No need to haul bulky, heavy packages home from the store. We make delivery easy and it's FREE! When you order an Ironclad basketball system, it will be shipped quickly, typically within 24 hrs. Additionally, it will be delivered by truck to your location and unloaded from the truck to ground level via an automatic hydraulic lift gate. You will typically receive your goal within 5-7 days. A tracking number will be emailed to you once your order has shipped from our facility. Ironclad's founders are responsible for the invention of some of the most recognized and influential aspects of the adjustable basketball goal: Most notably, the spring assist used to make basketball goals crank upward as easily as downward. This invention has been imitated by many companies over the years, but never truly duplicated. Installed our new basketball goal for my son's 8th birthday. It's been 3 weeks and not a day gone by where a ball hasn't passed through that hoop. It's obvious to me that this is a quality goal that will last until my son is off to college!